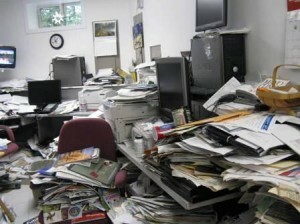 Dealing promptly with papers and information goes a long way to avoiding the stress of paper clutter! Paper is a clutter issue for just about everyone. Statistics show that 80% of what we keep, we never use or reference again. So we need to learn to be very selective about what we choose to keep in our files. o What is it? Identify the information. Is this a bill? An invitation? Research? o What is the next action required? The bill has be be paid; the invitation answered and the research incorporated into its project. o When is it due? Schedule in your planner when you intend to pay the bill or answer the invite. If the required action takes just a minute or so, take care of it immediately. o Who needs to take the action? Does this need to be delegated to someone else? o Who else needs this information? In the case of an invitation, you will want to pass the particulars on to others who are included. o Where will I put this so I can find it when I need it? Don’t think in terms of “where should I put this;” consider where you expect to find the information next time you need it. When there is a date associated that you have noted in your calendar, you can jot down in your planner where you file the paperwork. Keep active files easily accessible by using a desktop file holder, a desk drawer that accommodates hanging folders or even plastic file boxes. Create filing solutions elsewhere for reference and archive items that don’t need to be accessed frequently. You will want to schedule a regular routine for filing. It could be once a week, every two weeks or once a month. A basic rule of thumb is, if you are rifling through your “to file” pile, you are not filing frequently enough! Determine what the action is (pay a bill, make a phone call, do further research). Determine when you will do it and note it in your calendar or planner. Once you’ve scheduled the action in your calendar, you might want to note it on the paper (in pencil or sticky note) so that you don’t have to re-read the whole thing again. File it where appropriate, noting on the calendar where the paper is. How do you handle papers? Let us know in the comments! I would like to get the Quick and Easy Guide to Clearing Clutter. I subscribed to your Youtube videos and found them informative, that’s why I would like to learn more. I wish I could attend your workshops, but I live in New York. You can get the Guide by clicking the green button at the top of each page on the website. Let me know if you have trouble with that. I do work with clients by phone, so don’t hesitate to schedule an appointment.